Field day tomorrow….Avery’s last day on Monday…Tyler’s last day on Wednesday….can you smell the summertime?!?!?!?! I did a little scrapping today between chores. I made this one for our current journaling challenge to scrap something that made me laugh. Wade just taught Benji the word “appetizer”. He is always begging for food “at the beginning” of dinner while we are cooking. So now, he uses the word all the time. He wants ‘appetizers’ before *every* meal! LOL! Now I need to go finish watching the rest of the So You Think you Can Dance auditions! By the way your handwriting piece on the store blog was great too! surprise 🙂 That is what I meant to type, if only every site had spell check, Wade? They do… if you use Firefox with integrated spell checking! 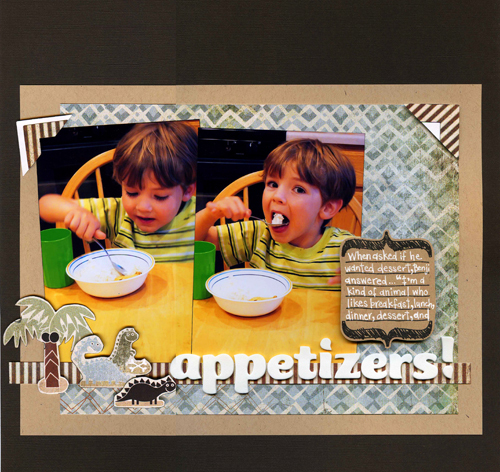 ha – this layout is great – love me some appetizers! firefox RULES! hee hee @ “I can’t wait ANY minutes!” I love kidspeak.